A dash cam is the best way to cover yourself should you have a collision with another driver, and it can also lower your car insurance premium which is always a bonus. 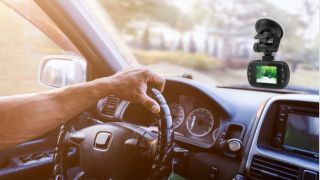 Dash cams are pretty easy to get your hands on these days, but with the plethora of options on the market, it can be difficult to know which ones are most reliable and what exactly turns a good dash cam into one of the best dash cams. With documenting your journeys in mind, check out our best travel cameras from DSLRs to Go Pros. One of the main considerations when choosing a dash cam should be the resolution, because the better quality the footage, the more reliable it will be should you need to dispute a claim. All dash cams will have at least 720p resolution, but these days it doesn’t cost much more to go for 1080p or even 4K quality. The best dash cams will also have a G-sensor, which use a motion detector which will recognise when you’ve been involved in a collision. The Thinkware F800PRO Dash Cam is a great example, and will even notify your phone should your car get knocked in a car park while you’re away from the vehicle. Check out our top picks below for more info on the best dash cams. If you’re looking for the best of the best right now, this Nextbase dash cam provides 4K image quality which means you’ll be able to see every detail of your journey with clarity. It boasts a wide-angled view of the road and uses a polarizing filter to reduce glare from the windscreen. One of the most convenient things about this dash cam is that it has built-in Wi-Fi so you can instantly share footage to your phone or tablet device, compatible with both Android and iOS. It also comes with a magnetic mounting point for hassle-free use. This sophisticated dash cam offers 24/7 surveillance of your vehicle and what’s more is that it can send you a notification to your smart device to alert you if there has been an unusual bump or knock while you are away. You can also access any footage from this dash cam on your phone at any time and receive speed camera and traffic alerts while driving. All footage is protected in the event of a collision so you won’t have to worry about corrupt files or lost footage. This high-res dash cam is designed not only to capture footage of collisions but to try to prevent them from happening altogether. The camera has an alert system which will warm you when you are too close to another vehicle. You’ll also get voice and screen alerts of upcoming speed cameras to help you stay within the limit at all times. This dash cam also allows you to instantly share footage to your phone when needed, so this is an all-round reliable camera to help give you peace of mind on the roads. If you’re looking for a reliable dash cam, then THE Thinkware F770 is rated highly for its high res footage both day and night. The super night vision allows you to clearly capture your surroundings even in low-lighting and poor visibility. The wide viewing angle will allow you to capture as much activity as possible, and the Thinkware alerts keep you in the know about traffic hazards along your route. This is a discreet looking dash cam with a small LCD screen that can cover a 180 degree field of view so you can make sure you capture more of the environment around you should a collision occur. The best thing about this dash cam is that you can command it to stop and start recording, or to take pictures using voice control. This allows you hands-free use of the cam and it’ll be in a prime position on your dashboard with the use of the magnetic mount which makes it easy to secure and remove from your vehicle. If you don’t want to fork out too much on a dash cam but would like to have peace of mind you can access footage when needed, then this Motorola dash cam is easy to use and comes in at just under £50.00 RRP. The quality is admittedly not quite as good as the others in the list, but it’s not below par either. The G sensor will detect any collisions and you’ll be able to use instant playback to view the footage at any time.